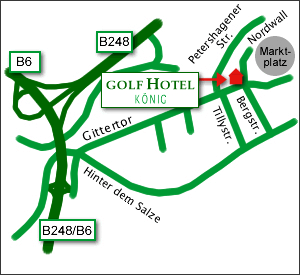 Hotel in Salzgitter Bad: GolfHotel König. Bed and breakfast. 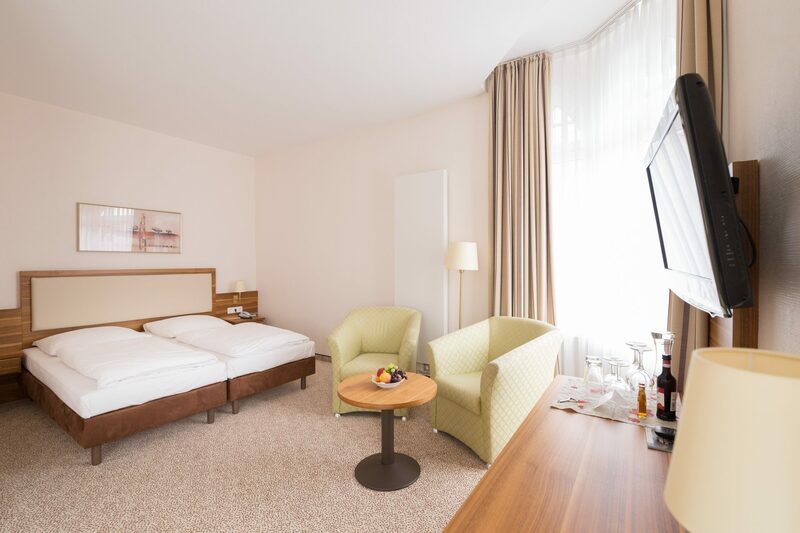 In the calm Old Town of Salzgitter – Bad we offer you an excellent setting for a pleasant and relaxing stay. Years of experience have taught us how to cater for your every needs. For you as our guest we are pleased to fulfill your individual wishes. 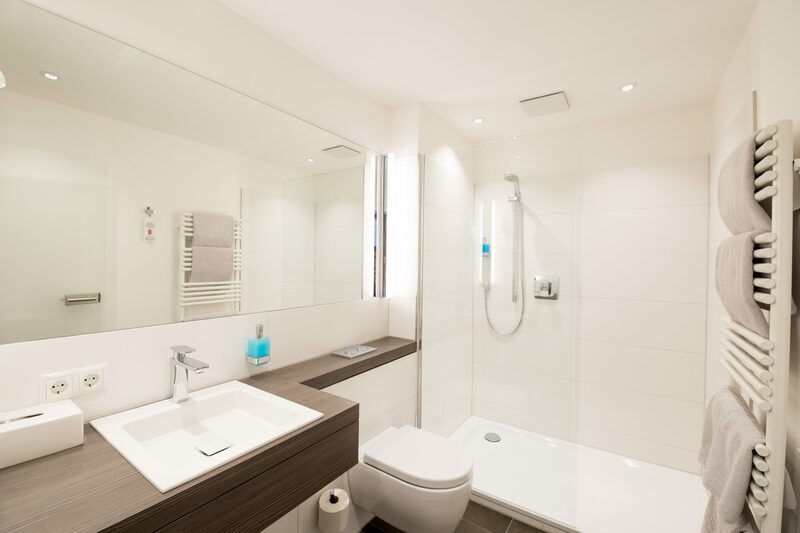 Our exclusively equipped rooms make forget the daily routine. 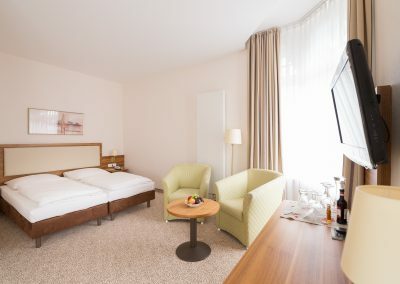 Each of our 32 bright and friendly equipped rooms have a modern colour scheme and comfortable and individual fittings. 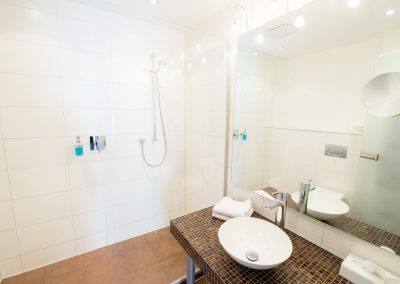 En-suite rooms all with bath tub or shower and WC, cable-TV, wireless internet access via hotspot of DEUTSCHE TELEKOM and at an additional charge, mini bar, hairdryer and direct dialling phone. For special comfort some rooms provide radio and trousers-press. As an additional service we offer cleaning service for clothes on request. 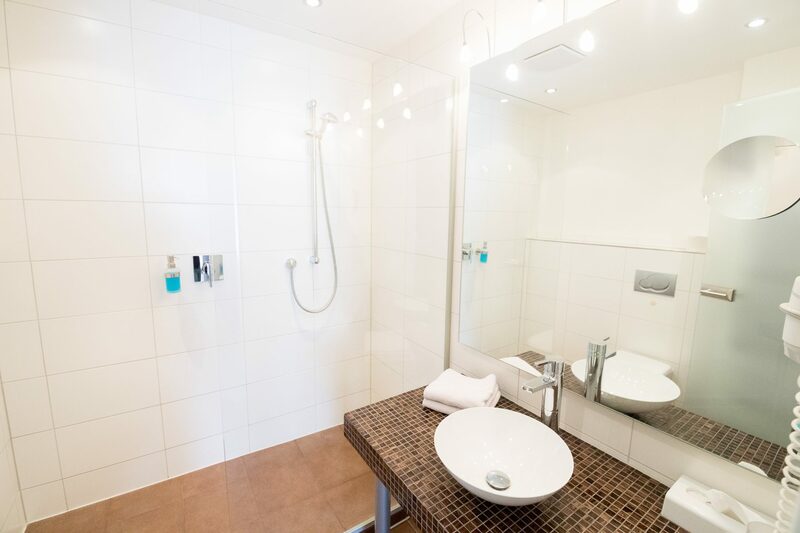 We have one room at your disposal which is particularly suitable and offers facilities for handicapped persons. For further information please contact us in advance. Begin the day with a well-balanced breakfast in our breakfast room. A buffet with a large variety of healthy products for a diverdified alimentation is available. For your daily information we offer various newspapers and magazines (only in german) . Additionally you will find a lot of restaurants of various kinds within a few minutes walking distance of the hotel. Salzgitter – Bad, a town of 24.000 inhabitants, is the traditional part of Salzgitter. Near our hotel you will find the Old Town with the famous “Klezmer-Platz” and the sculpture path. Our sporty active guests may like the opportunity to use the nearby 18-hole-golf-course or to relax in the nearby swimming pool with its natural thermal water. 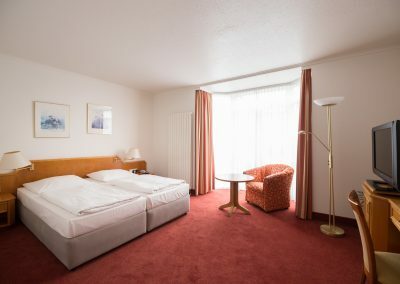 Our hotel comes with 32 rooms (4 single rooms and 28 double rooms). The above mentioned prices are per room/night including breakfast and VAT. Special offers for weekends, public holidays or new year’s eve are available on request. For a long-term offer please contact us. Children up to two years stay in a baby crib for € 10. For children up to 16 years we offer an additional bed for € 25,- (of age 17 and older € 35,- for an additional bed). If you want to stay with a whole group with us (parking facilities for busses are available on request) we gladly assist you with some recommendations for daily program. Pets are welcome in our hotel. Prices on request. Salzgitter is the third biggest industrial location of Lower-Saxony with the biggest inland port in northern Germany. 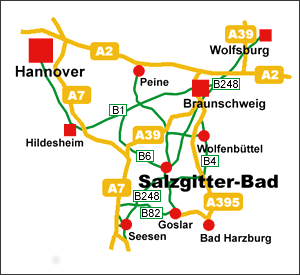 Salzgitter is situated in a region where different motorways converge.